New homeowner Brittany Taylor does the honors with the scissors. Chief Gary Batton, Assistant Chief Jack Austin Jr., and District 4 Tribal Councilman Delton Cox join in the ribbon cutting ceremony for 10 new homes in Cameron on Friday. The construction project is through the Housing Authority of the Choctaw Nation’s LEAP program. 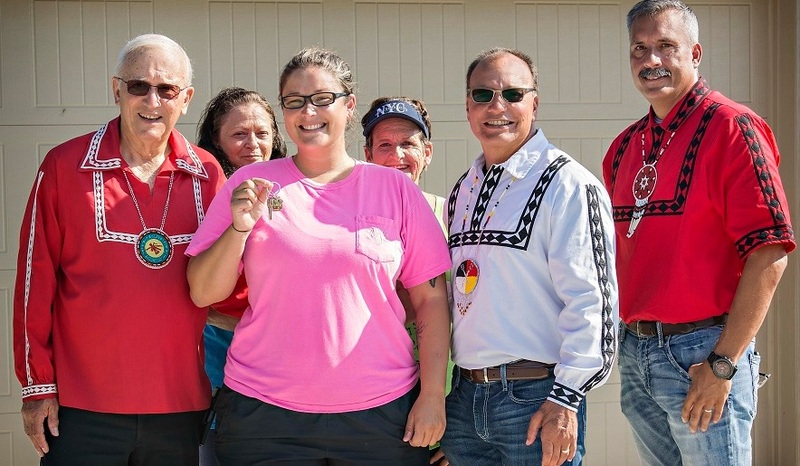 Choctaw Nation tribal officials and family members congratulate Brittany Taylor as she receives the keys to her new home Friday, August 10 in Cameron. CAMERON, Okla. – One beautiful new brick home being built in Cameron, a town of 115 households, according to the U.S. Census, would be noticed. But, on Friday, August 10, the Choctaw Nation Housing Authority opened 10. This called for a ribbon cutting ceremony, tours to be conducted and family photos in front of their new homes. For that homeowner, Brittany Taylor, being handed the keys to her new front door is a milestone of the Choctaw Spirit. “I turned 33 yesterday,” Taylor said. But there has hardly been time to sit down and celebrate. “I’m moving into my new home,” she said. She has a lot to do before she gets back to her three jobs. She has been renting for the past three years in nearby Pocola. It’s not been easy for the single mother. She had to drop out of college and had a financial set back after a divorce. “My car was even repo-ed,” she said. Still, the mother of two, ages 8 and 10, saw there were those who needed help as much as she did. Taylor had the heart to become a foster parent to three more children in need of a home, all under age five. The Native youth were under the care of the State of Oklahoma. She took care of them until they could be returned to their own families. While there are no additional children with her at this time, she knows there will be more in her future. A firm believer in community service, Taylor volunteered three years with Paint the Park Pink. The breast cancer awareness drive is Fort Smith, Arkansas’s largest fundraiser. “I’ve had to keep my focus on making things better for my family,” she said. It’s an effort that is paying off. Except for her home, Taylor will be debt free in November of this year. As the dedication got underway, District 4 Choctaw Singers performed traditional hymns in the Choctaw language and officials were introduced, including municipal and Le Flore County officials, the Choctaw Nation Tribal Council and members of the Housing Authority of the Choctaw Nation. Choctaw elders mingled with townspeople of all ages who were in attendance. The Cameron houses are located on Barnes and Ward streets. The addition features 10 houses: one is a four bedroom, two baths and nine are three bedrooms, two baths, ranging from 1,422 to 1,553 square feet. All have two-car garages and sodded lawns. The all-electric residences come equipped with new appliances, central heat-and-air, and safety features. Each district of the Choctaw Nation is slated to receive 10 LEAP houses this year. Director of the LEAP program is Mandi Young, who can be reached at myoung@choctawhousing.com or 800-235-3087.